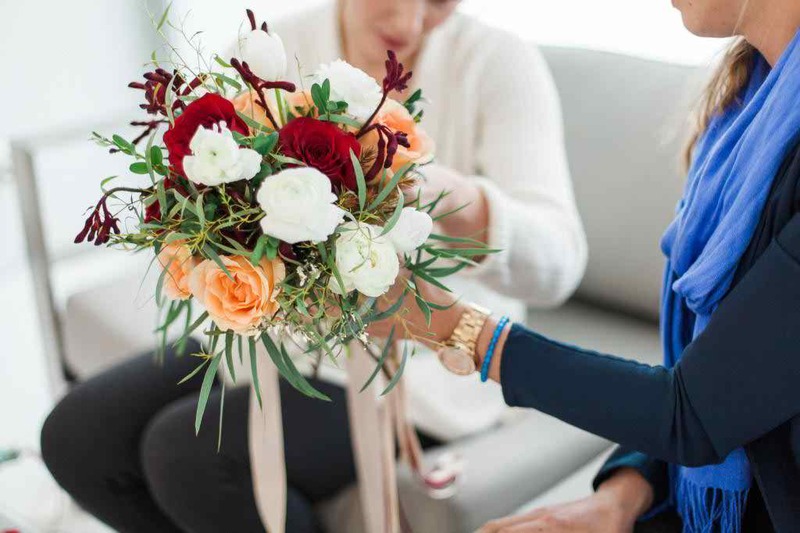 Behind every great wedding, there's a team of wedding pros who are working their magic behind the scenes. They are florists, stylists, cake artists, calligraphers, hair and makeup artists, and photographers. (just to name a few). They are the ones who make sure that everything is in place. They work tirelessly and are often unseen. But today I'm pulling back the veil a bit to give you a little peek at the creative process. With creative direction and styling by Created Lovely Events and floral design by Lavender + Lace Floral Design there's so much pretty here and I'm just so thankful that Royce Sihlis Photography was there to capture every pretty detail. From the designer, "When planning this shoot I really wanted to do something unique and wintery. I decided to forgo the table setting and let each vendor’s talent really shine in this mock vow renewal shoot. It was designed to be fresh and vibrant with a focus on romantic details and a nod to the holiday season." More from the designer, "We chose to mix berry tones and greens with navy and peach for a unique take on a winter palette. Pinks and reds can be seen in the vibrant scarf for the bride, the bouquet and silk ribbon, and the delicious sugared cranberries on top of the cake. And then for contrast we added touches of navy and plum seen in the groom's attire as well as the sugared blueberries on the cake, and the gorgeous calligraphy." So much to love about this. Am I right? So much work was put into bringing this wonderful shoot to life. But it's not just the lovely details I'm swooning for. You can just feel the love here. And there's good reason. You see, the models themselves were actually newlyweds themselves! Oh, and how great is it to get a glimpse of what goes on behind the scenes? I really enjoy seeing the creative process. And most importantly, it's just really great to catch a glimpse of how it all comes together. Furthermore, I'm just going to put this out there - but I personally don't think "wedding vendors" is an adequate name to describe what these dream teams do anymore. Magic makers? Wedding artists? Event Stylists? Wedding Creatives? Yep, that sounds like a better fit. Here's to the creative ones! 13 Comments " A Styled Vow Renewal + A Glimspe of the Creative Process "
This is so sweet! I love the pops of color against the white background! Cute shoot. And I love her pashmina! The collection of wreathes is delightful! The contrast is pretty amazing! I love this behind-the-scenes take on a styled shoot. It's a perfect way to showcase amazing wedding vendors. And we all know how you choose your vendors can make or break a wedding! Seeing everything behind the scenes is so cool! Ooh, thank you so much for giving us a peek behind the scenes, looks like so much fun but I know it's also a lot of hard work and I agree that the professionals in the wedding industry should be endowed with a new moniker - magic makers is perfect! Lovely inspiration and always enjoy a peek behind the scenes! Thank you so much for sharing this beautiful post! I was able to use one of the images in my inspiration today and hope you enjoy the post as much as I do this one!